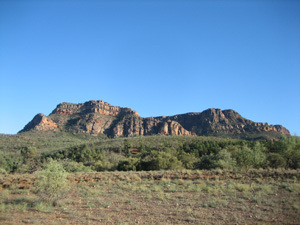 The Flinders Ranges is just about as beautiful a part of South Australia as I have seen. The wide open spaces, immense blue skies and the staggeringly amazing ranges themselves make it a very special part of the state. It is difficult to take 600,000,000 years of geological history for granted when it looks this impressive. I have ridden through the Southern Flinders Ranges on a number of occasions and I usually commit to largely off-road adventures. Once or twice I have combined the dirt with the bitumen. No matter what your preference is in terms of terrain, this part of the world offers a great opportunity to load your pack, get on your bike, and ride. I have based this piece around a three-day journey, taking in the Flinders between the towns of Quorn and Blinman, although it could easily be broken up into smaller sections and enjoyed over a week or so. Most of the towns offer accommodation in pubs, hotels and/or caravan parks. There are also options available at converted stations, lodges and other properties dotted along the route. Bush camping is an easy option for those who prefer being out in the open. As part of your preparation you will need to acquire a good set of maps. Excellent maps of the Mawson Trail and its surroundings are available from Bicycle SA. The weather and terrain conditions vary over the course of the year so you will need to research and decide when you would most like to go. I have always visited the region in autumn and have enjoyed warm, dry days. You will also need to plan how you will get up to the Flinders, and how you will return from Blinman. Mobile coverage is a little hit and miss so you’ll need to investigate and plan your communications accordingly. Make sure you pack spare tubes, sufficient tools and anything else you might need. Replenishing supplies is a challenge once you are north of Hawker –although shops offering the essentials can be found in Rawnsley, Wilpena and Blinman. For those needing to hire bikes you can do so from Bicycle SA in Adelaide; bike hire is also available from ‘Over the Edge’ in Melrose. Whatever you choose as your ride, make sure it is in good working order before you set out. Planning is a vital component of your trip and it is important that you, and your bike, are ready to ride. Quorn makes for a good place to leave the car behind and start an adventure that takes in the sights of the Flinders and ultimately delivers riders to the famous historical mining town of Blinman. 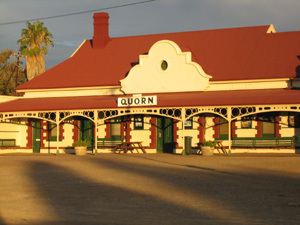 There is accommodation in Quorn, and its railway history makes for an interesting yarn over the bar of one of the four pubs in the main street, one of which being the iconic Transcontinental Hotel. The direct route between the two towns via the road runs to a distance of 67 kilometres. The off-road journey, if sticking largely to the Mawson Trail, will have you pedaling for approximately 105 kilometres. 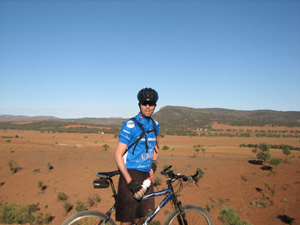 The Mawson takes you out of town before heading up and over Yarrah Vale Gorge, providing some great views as you climb. It is a smooth ride, but riders will likely be looking for gears as the summit nears. Road riders naturally have an easier ride, yet are still afforded the opportunity of detouring and visiting some fascinating sites. The ruins of Simmonston, ‘the town that never was’, lie on the Mawson Trail. It is a few kilometres off the main bitumen road, and you will have to endure some fairly corrugated tracks as you travel across the Willochra Plain, but the site itself is worth a look. In the midst of this sun-blasted desolation, lie the remains of a town that was intended to be serviced by the railway and was surveyed in 1908. The general store and hotel were built. Alas, the railway ended up missing the town by 20 kilometres, and Simmonston was left to quietly turn to ruin. 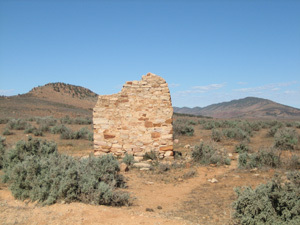 Much closer to the main Quorn-Hawker road are the Kanyaka Homestead ruins. Kanyaka was established in 1851 by Hugh Proby, third son of a British Earl. He died the next year, attempting to cross the flooded Willochra Creek. He was 24 years old. The site of Proby’s grave is situated nearby on the Mawson Trail, as is the now shallow Willochra creek. If the water is present it is quite a picturesque place to stop and take a moment. This is a long day in the saddle for off-roaders but for those who are uncertain about their capacity the option is there to ride the dirt for 60 kilometres until intersecting with the main Quorn-Hawker road, and then turning left for a relatively easy journey into Hawker. If you prefer to continue off road, the afternoon provides a long stretch of undulations en route to Wilson Road. This is followed by traversing some fairly impressive and desolate landscape, culminating in a long, straight and fast run into Hawker. I have ridden off-road along this stretch on both mountain bike and hybrid (with suitable tyres) and, although a mountain bike is best, the hybrid has also met the challenge. The Hawker to Rawnsley leg can be completed as a short and pleasant 35 kilometre on-road ride. 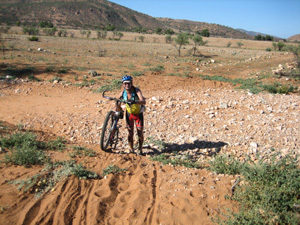 Dirt riders will enjoy a ride of around 95 kilometres. There are great views of the Elder Range that are equally impressive from the road or from the Mawson Trail. The Arkaba Station is just off the main road and is an ideal place for roadies to enjoy a break. The Mawson Trail is very sandy for a few kilometres, once riders are beyond Hawker. The level of sand is affected by weather conditions, and I have been through when it is a significant challenge; on other occasions the ride has been much easier. Mawson devotees will also travel the Moralana Tourist Drive and marvel at the wonderful scenery. This has to be earned though, as the “road” surface is jarring. The last leg of the day's ride is a gently rising 10km stretch of bitumen that delivers the rider nicely to the entrance to the magnificent Rawnsley Park. The recently completed bitumen road that connects Wilpena to Blinman makes for a fairly quick and direct run between the two locations. This 59 kilometre stretch of road provides similar scenery to that of the Mawson trail, which meanders a few kilometres to the west of the road. The road trip is around 80 kilometres, while the dirt comes in at approximately 95. Roadies can take the gentle four kilometre track back out of Rawnsley and rejoin the main road at the entrance to the park. Mountain bikers can, if they choose, take an early morning trip around the bluff on one of the more technical stretches of the entire Mawson Trail. Riders are taken around the breathtaking Rawnsley Bluff, up and down the dry, stony creek beds, before they are spilled out onto the same road, approximately five kilometres further along. At Wilpena, the decision you face is whether to take the bitumen or the dirt. On each occasion I have made the trip, the only option was dirt. The road didn't exist. The couple of hours spent riding between Wilpena and Bunyeroo lookout is an experience not forgotten in a hurry. The single track is quite fast and narrow (and the creek beds quite deep! ), but always fun. Riders will dodge, duck and pedal their way through the Flinders Ranges National Park, sandwiched between the magnificent Heysen and ABC Ranges. This leg is best attempted on a mountain bike, although I did complete the journey onboard a hybrid on one occasion. There's climbing to be done after that, but there are a number of spectacular lookouts where riders can stop, take a well-earned breather, and marvel at the scenery. The view from the well-known Razorback lookout is something to be savoured, especially after the climb to get there! 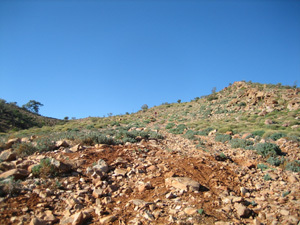 The next stage of red dirt riding is undulating, and riders will almost be relieved to emerge from the national park and join the main road into Blinman. On the way into Blinman riders will be able to see the “Great Wall of China” a natural rock formation that resembles the famous landmark. You will also pass the Alpana homestead, which provides accommodation. 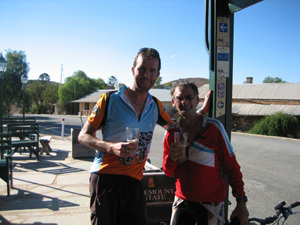 The North Blinman Hotel will be a welcome sight to the thirsty rider; some of the best beers I have ever had in my life have been consumed under the verandah situated at the front of the pub. Rooms are available for those wanting to finish their trek in comfort. Of course, some riders will be pressing on to other destinations but Blinman has always represented the end of the journey for me. Whether choosing to ride on bitumen or dirt, this part of the country offers much in terms of challenge and reward. It is sometimes desolate, sometimes very hard work, but it is always beautiful. Riders can, with the appropriate level of planning and training, enjoy a very satisfying cycling holiday in and around the Flinders. Like most rides, it is much more enjoyable when riding with others, so go with a friend.